The initial machine designed by Newman kept on breaking down. Flowers later recalled: "I was brought in to to make it work, but I very soon came to the conclusion that it would never work. It was dependent on paper tape being driven at very high speed by means of spiked wheels and the paper wouldn't stand up to it." Flowers suggested that Newman used valves instead of the old-fashioned electromechanical relay switches that had been used in Turing's machines. He claimed valves would do the same job much faster without the need for the synchronisation of the two tapes. Tommy Flowers had a meeting with General Dwight D. Eisenhower on 5th June. He was able to tell Eisenhower that Adolf Hitler was not sending any extra troops to Normandy and still believed that the Allied troops would land east of the Pas de Calais. Flowers was also able to report that Colossus Mark II had decoded message from Field Marshal Erwin Rommel that one of the drop sites for an US parachute division was the base for a German tank division. As a result of this information the drop site was changed. 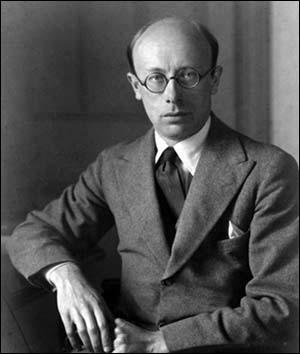 Max Newman, one of the mathematicians working in the Testery, became convinced that, using the principles advocated by Turing in his pre-war treatise on a computing machine, it would be possible to build a machine that, once the patterns of the wheels had been worked out in the Testery, would find the settings of the first row of wheels, thereby making the codebreakers' task immeasurably easier. Newman, an academic from Cambridge University, took his ideas to Travis and received the necessary backing and promise of funding to set up his own section, which became known as the Newmanry. He then went to Wynn-Williams at the Telecommunications Research Establishment in Malvern and asked him to design the machine. It was known as 'Robinson', after Heath Robinson, the cartoonist designer of fantastic machines, and the first version was delivered to Bletchley Park in May 1943. It worked on the principle that although the encyphering letters were supposed to be random, they were not. No machine can generate a truly random sequence of letters. Robinson compared a piece of teleprinter tape carrying the encyphered text with a piece of tape on which the wheel patterns had been punched to look for statistical evidence that would indicate what the wheel-settings were. Robinson was designed to keep the two paper tapes in synchronisation at a thousand characters a second but at that speed the sprocket wheels kept ripping the tapes. Turing who, while working on the bombe, had been impressed by the abilities of a bright young telephone engineer at Dollis Hill called Tommy Flowers, suggested to Newman that he might be just the man to get Robinson to work. 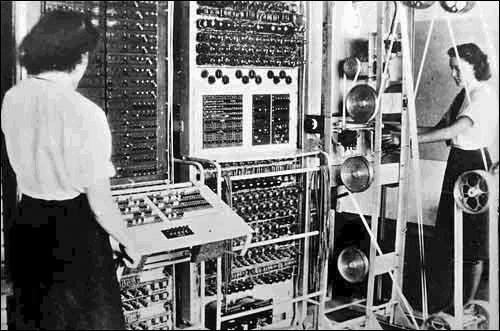 Colossus was the first practical application of a large-scale program controlled computer and as such the forerunner of the post-war digital computer. Although it had a specialised function, it showed that Turing's theory could be turned into practice. 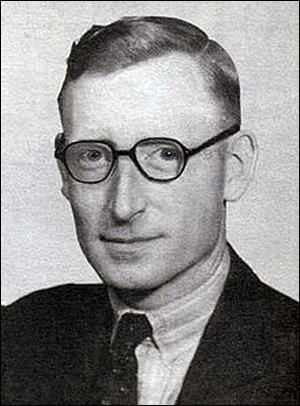 The sequence of operations was determined mainly by setting of external switches and plugboards, which were controlled by Wrens on the orders of the Newmanry codebreakers. Just like the Robinson, it was looking for sequences that were not random. "The work on Tunny divided roughly between what you might call the machine work and the hand work," Halton recalled. "Machine work was of course putting messages on to Colossus which was a process whereby we would determine the starting positions of the first set of five wheels which were involved in making up the key. Then after that process had taken place, that is to say a process based on statistics, mathematics, the message shorn of part of its key would come to the codebreakers in the Testery who would then have the job of using their knowledge of expected pieces of text in order to set the remaining wheels." Flowers and his group built the first Colossus in eleven months. Its photoelectric punched-tape reader operated at five thousand characters per second, a remarkable speed for those days. Flowers was a pioneer in the redesign of the electronic decision-making circuits that had been invented before the war. The first "string and sealing wax" (Flowers' own description) version of the Colossus was a tremendous success. Again Flowers and Radley anticipated a future demand and made preliminary arrangements for production. 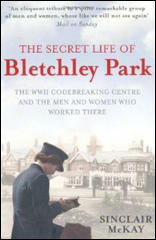 Around March 1944 Dollis Hill received an urgent request from Bletchley Park for more Colossi. They produced them, thanks to their preliminary arrangements, and the effective speed of sensing and processing the five-bit characters on punched paper tape was now twenty-five thousand characters per second. Moreover, as Brian Randell points out, Flowers had introduced one of the fundamental principles of the postwar digital computer-use of a clock pulse to synchronize all the operations of his complex machine. They wouldn't believe it. They were quite convinced that valves were very unreliable. This was based on their experience of radio equipment which was carted around, dumped around, switched on and off, and generally mishandled. But I'd introduced valves into telephone equipment in large numbers before the war and I knew that if you never moved them and never switched them off they would go on forever. They asked me how long it would take to produce the first machine. I said at least a year and they said that was terrible. They thought in a year the war could be over and Hitler could have won it so they didn't take up my idea. They decided they would proceed hopefully with the Robinson, which is what they did, and they left the question of whether the valve-based machine would be constructed or not to me. I was so convinced that Robinson would never work that we developed the new machine on our own at Dollis Hill. We made the first prototype in ten months, working day and night, six-and-a-half days a week, twelve hours a day sometimes. We started with the design of what was to be called Colossus in February 1943 and we had the first prototype machine working at Bletchley Park on 8 December. The purpose of the Colossus was to find out what the positions of the code wheels were at the beginning of the message and it did that by trying all the possible combinations and there were billions of them. It tried all the combinations, which processing at 5000 characters a second could be done in about half an hour. So then having found the starting positions of the cypher wheels you could decode the message. When we'd made it for them and they saw it work, they were really astounded. It had about 1500 valves in it, which horrified Bletchley Park. But one of the disadvantages of Robinson was that it didn't always give you the right answer. The answer that they got from the machine was in numbers, a counter counted the number of times that certain letters appeared and the counter was a bit unreliable so they didn't always get the same count. What they did with Colossus, the first day they got it, was to put a problem on it to which they knew the answer. It took about half an hour to do the run. They let it run for about four hours, repeating the processes every half hour, and to their amazement, it gave the same answer every time. They really were amazed. It was that reliable, extremely reliable.